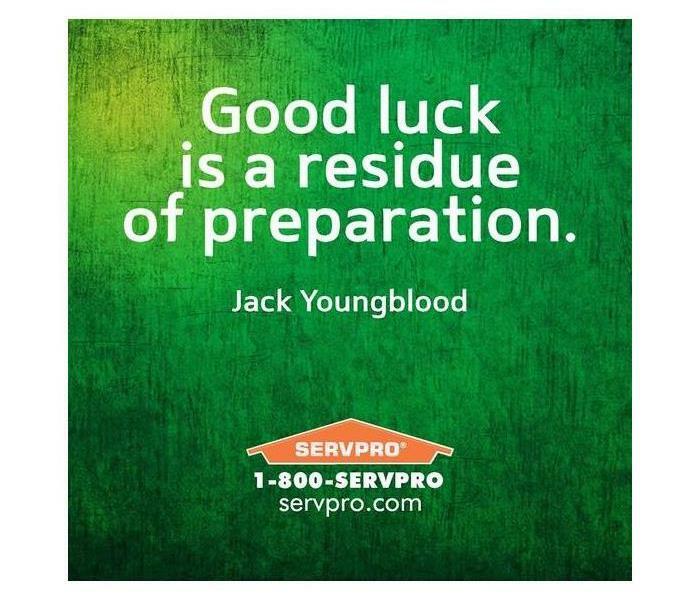 SERVPRO of Suffolk/Smithfield/Franklin is ready to answer the call 24/7/365! As an independently owned business ourselves, we understand that business continuity is extremely important and that every hour lost is a customer and revenue lost. And with our highly trained and certified technicians, we can prevent loses such as water damage and mold from being a long-term problem to your business. Being that we are a 24-hour franchise, we have a flexible schedule to work around time strains you may have. We have the experience and the technology needed to solve any problem. 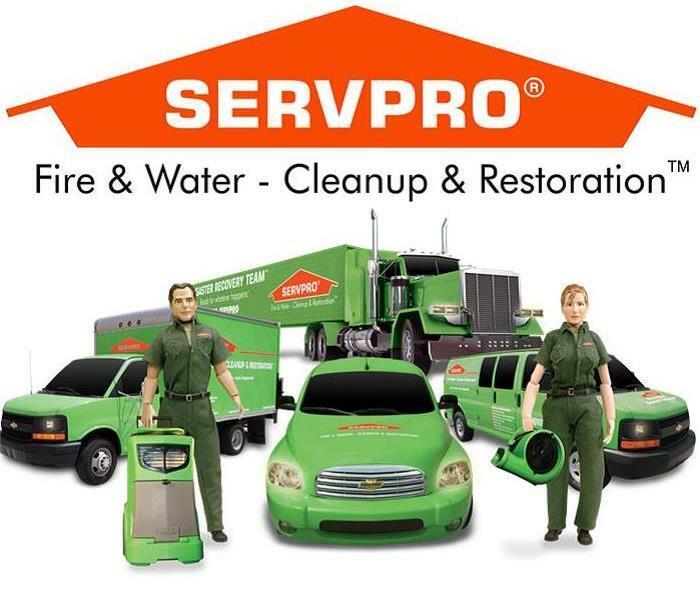 If your business is damaged by water, fire or any other forces of mother nature, don’t hesitate to call SERVPRO of Suffolk/Smithfield/Franklin, 757-934-8404. Water damage can cause stress in the home or workplace. Whether your water loss is large or small, it is crucial to remediate the situation quickly to prevent any further issues. Water is classified into 3 categories, and it’s important to be able to distinguish the differences among them. The first category is “Clean Water.” Clean water is the least contaminated, and comes from a clean source, like a leaky faucet or water line. It can turn into a category 2 or 3 if left untreated and exposed to factors such as temperature and other contaminants. Blackwater is severely contaminated. Having contact with black water can cause serious illness, and in some cases even death. Examples of black water include flooding from waterways and standing water. Blackwater may contain chemicals, microbes, and sewage. Avoid any contact with black water. At SERVPRO of Suffolk/Smithfield/Franklin, we want our customers to have peace of mind knowing they will be taken care of by our certified professionals. Our state of the art equipment will have your home or business dry, clean and back to normalcy in a timely and professional manner. 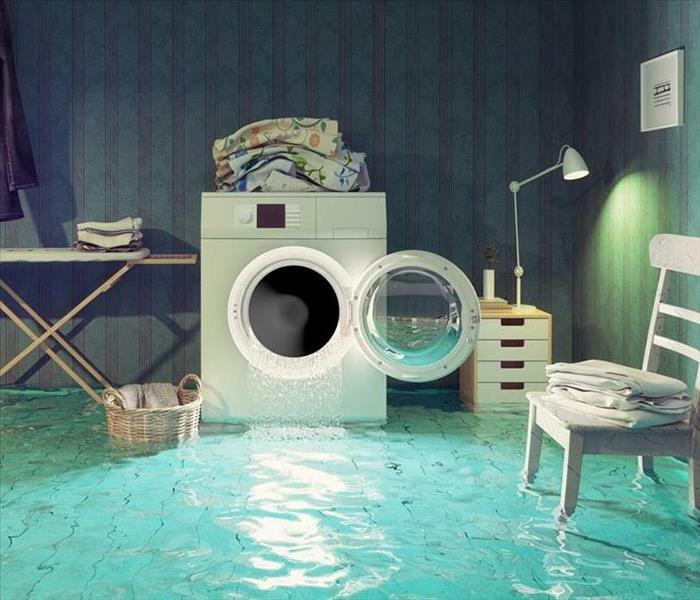 If you have any concerns related to water damage, or to schedule an estimate, please call us today at 757-934-8404. Do you know what the number 1 culprit is that weakens the foundation of your home? WATER DAMAGE! Similar to core strength of your body, water damage hits the core strength of your house causing harm to your property. Below are some strategies on how to prevent any future water damages. Gutters need to be cleaned on a routine basis. If not, a clogged gutter can damage the siding and foundation of your home. The maintenance cost of cleaning your gutters depends on the size and height of your home. On the contrary, it cost no money for you to clean your gutters yourself. Your sump pump should be checked to see if it's running properly at least once a year. When it comes to storm seasons, several checks should be conducted. To test your sump pump, slowly fill the sump pump pit with water, watch the "float' to rise and then watch to make sure that the water level falls. It's free to get your sump pump professionally tested. If you get the chance to fix a leak shortly after it started, there may be no long-term damage at all. However, if you have persistent leaks, it can lead to mold growth, termites, ants and more. To check for leaks, check dark spots under pipes, inside sink cabinets, and stains on ceilings. If you have any questions/concerns, please call SERVPRO of Suffolk/Smithfield/Franklin, 757-934-8404. Our team is certified and well trained to make it look and feel "Like it never even happened." 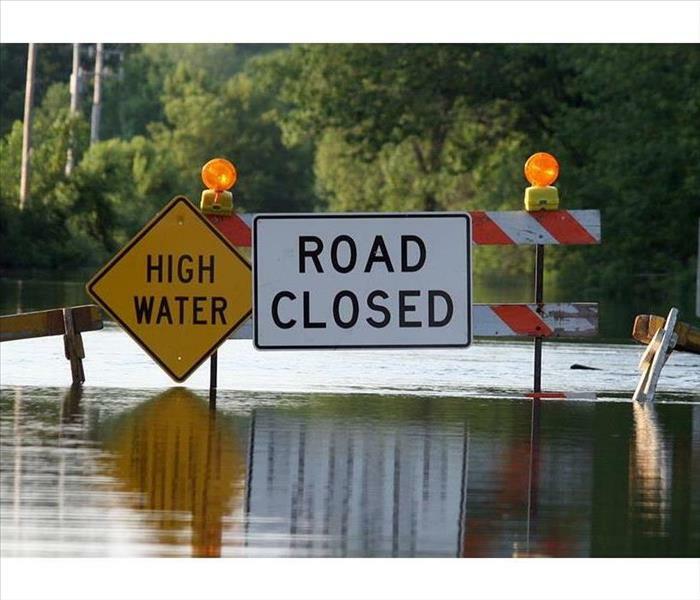 Stay away from floodwaters. If you come upon a flowing stream where water is above your ankles, Stop, Turn around, and go another way. If your home or business is affected by a flood, SERVPRO of Suffolk/Smithfield/Franklin is your water damage restoration company. Even minor floods have the potential to cause major damage to a structure if not treated properly and quickly. 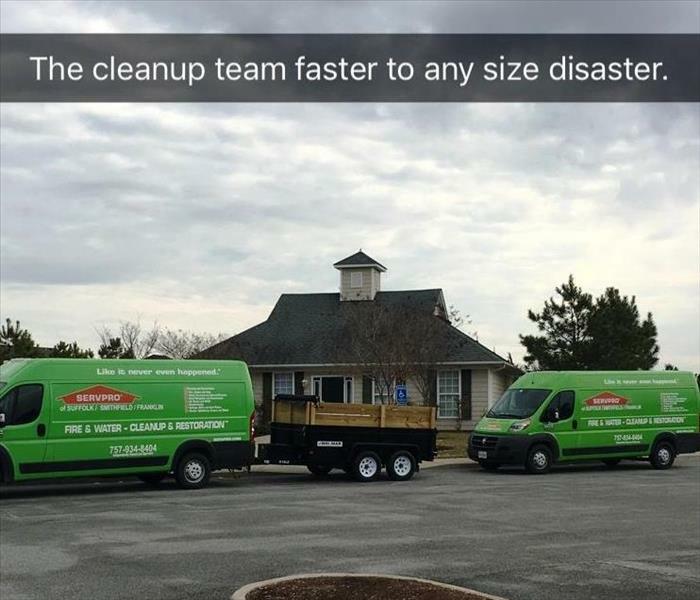 Cleanup can be overwhelming and that’s why SERVPRO of Suffolk/Smithfield/Franklin is prepared to handle any size disaster. When fire and water take control of your life, let your local SERVPRO of Suffolk/Smithfield/Franklin help you take it back. Call us 24 hours a day, 7 days a week at 757-934-8404. 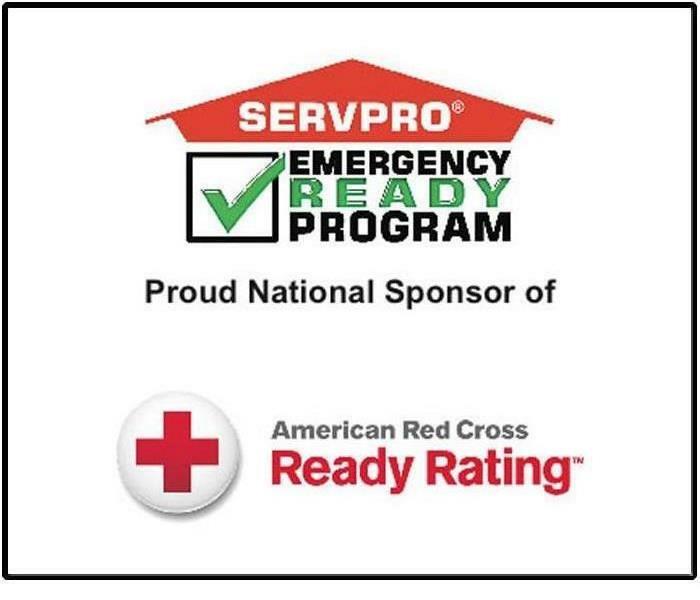 SERVPRO of Suffolk/Smithfield/Franklin is a leading expert in providing Emergency Ready Profiles (ERP’s) for area businesses, apartment community's, churches, municipalities, and non-profit organizations. An ERP is simply a plan of action of what to do, who to call, and emergency contacts! It will also include where the water shut off valves are, and electrical panels, plus so much more. One advantage of being prepared for a disaster includes reducing business interruption. Most people do not know that as many as 50% of businesses never recover following a disaster because a plan was not in place ahead of time. We can provide a no-cost assessment of your facility and not only provide you with a concise profile that contains critical information needed in the event of an emergency but give you access to our “SERVPRO ONLY” mobile app which puts this information at your fingertips at all times! 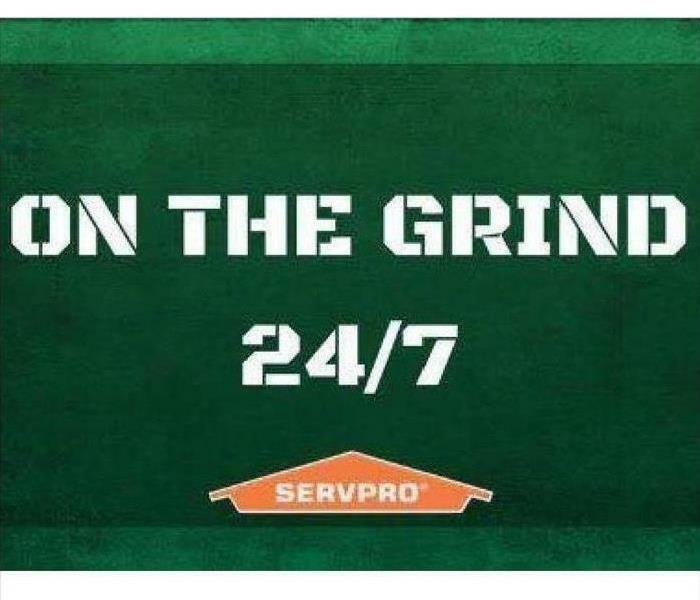 SERVPRO of Suffolk/Smithfield/Franklin is here when you need us, 24 hours a day, 7 days a week, 365 days a year! Flooding and water emergencies don’t wait for regular business hours and neither do we. SERVPRO of Suffolk/Smithfield/Franklin provides emergency cleaning and restoration services 24 hours a day, 7 days a week—including all holidays. Flooding and water damage is very invasive. Water quickly spreads throughout your home and gets absorbed into floors, walls, furniture, and more. SERVPRO of Suffolk/Smithfield/Franklin arrives quickly and starts the water extraction process almost immediately. This immediate response helps to minimize the damage and the cleaning and restoration costs. SERVPRO of Suffolk/Smithfield/Franklin, Call for all your emergency needs! We are here to assist in your time of need 24 hours a day and 7 days a week. You can call at 10 pm on a Saturday night and your call will be answered by one of our trained managers. SERVPRO of Suffolk/Smithfield/Franklin understands that when your business or home has water coming through your ceiling, sewage backed up from your toilet or water coming through your light fixtures you can not wait until Monday for emergency services. 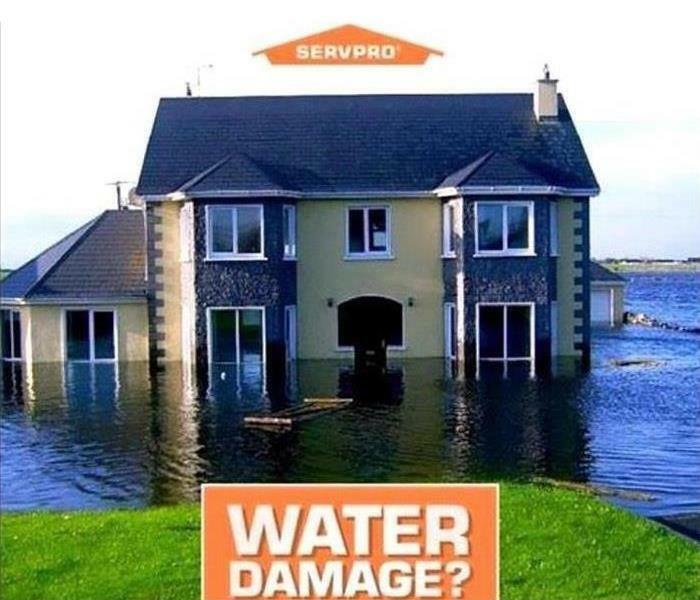 If your home or office is affected by disasters like water damage or fire, SERVPRO of Suffolk/Smithfield/Franklin is ready to help you start the mitigation process and dry out your structure. Our teams of trained production techs are ready to walk through the process with you, just call us at 757-934-8404, 24 hours a day, 7 days a week. What is a Furnace or Fireplace Puffback? Laughing at someone in a movie whose face has just been engulfed with black soot after standing in front of a fireplace is one thing, but in the real world when you hear that distinctive loud wuff sound, it turns into something else altogether, not so funny. 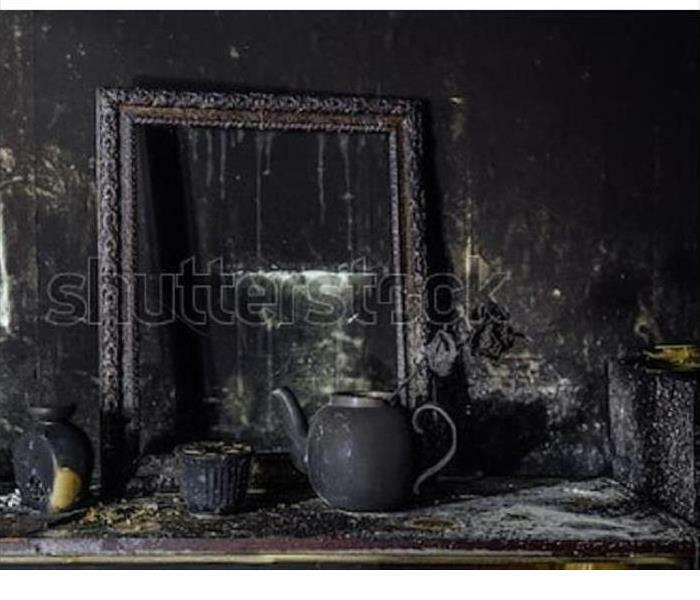 When your fireplace or furnace creates a puff of soot inside of your home, often called a puffback, suddenly you have a real sooty problem that needs to be handled quickly. When a puffback happens, soot and oil residue can literally cover every surface that it can reach. Puffbacks normally happen around this time of year when furnaces and fireplaces are fired up, no pun intended, after being dormant all summer. In a furnace, a puffback is usually caused by a buildup of excess fuel, oil, even dirt or dust in the ignition chamber. The buildup prevents oxygen from reaching the combustion chamber. When the ignition flame in the furnace pulls in the rush of oxygen it needs to ignite, the result is a powerful explosion of soot and oil that can even come out of the wall or floor vents. In a fireplace or woodstove puffback, the cause can be like the furnace, however, the cause is most likely a problem in the chimney. There is usually a buildup of ash and leftover residue clumped in the chimney that creates an uneven airflow of oxygen and carbon dioxide. The kindling and wood have plenty of fuel, but the oxygen it needs to burn is stuck above the chimney blockage. The fire will eventually correct the imbalance by sucking in a large amount of oxygen all at once, igniting the excess fuel in the fireplace and the buildup in the chimney all at once. The force of the ignition pushes ash and soot out of the fireplace. Puffbacks can usually be prevented by routine chimney and furnace maintenance. If you experience soot or smoke call SERVPRO of Suffolk/Smithfield/Franklin, 757-934-8404. 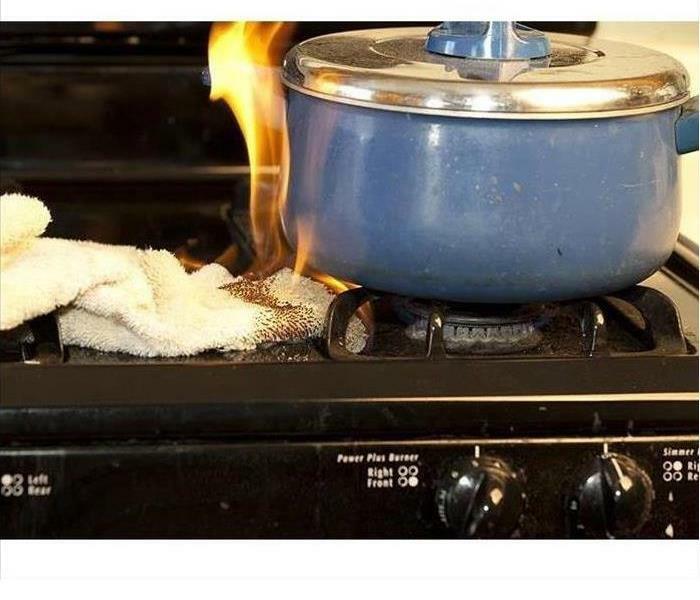 Cooking is the leading cause of home fires and home fire injuries. Travelers Insurance offers these safe cooking behaviors to help keep you and your family safe. Never leave your cooking equipment unattended while cooking, turn it off. Don’t wear loose clothing, roll up your sleeves. Keep your cooking area clean and remove any items that may explode or catch fire, like a paper or kitchen towel, oven mitt, non-dairy creamer, or flour. Remove any grease buildup from your cooking area. Keep a fire extinguisher in the cooking area. Be sure to have the correct type of extinguisher and know how to properly use it. Don’t throw hot grease into the garbage. Let it cool and harden then dispose of it. Don’t store food items in your oven. People forget that there is food in there and it could catch fire when preheating. What do you do if you do have a cooking fire? Your safety comes first. Leave the scene if you aren’t sure if the fire is safe enough to combat, call 911 for help. The fire department will control the fire. If the fire is small and you are going to attempt to extinguish it, call 911 for help first. The fire can get out of control quickly and having help on the way is safer. Never throw water on a grease fire, smother it. Watch how the water will turn to burning steam and the oil will splash and spread the fire. If you can, use a mitt to carefully slide a lid onto the pan and safely turn off the heat source. Don’t attempt to remove the pan until the fire is out and the pan has had time to cool. Keep the door closed for an oven or microwave fire and turn off the heat and electrical source. Don’t open the door until the flames are gone. If you suffer fire damage, call SERVPRO of Suffolk/Smithfield/Franklin, 757-934-8404. 2/19/2019 - SERVPRO of Suffolk/Smithfield/Franklin, Call for all your emergency needs!